- These steel tip darts are detachable design provide exceptional balance and styling. - The barrels have strategically placed knurling and grooves, which provide excellent gripping points, enhancing your control. - Feature poly pro dart flights which are specifically designed to help increase speed and reduce drag, delivering a consistent flight path and pinpoint accuracy. 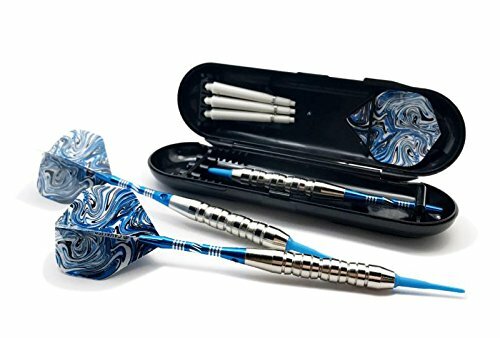 - All level players will appreciate the quality of this dart set. **Darts are not toys, Parental guidance suggested for children under 13 years old. ✔ TOTAL LENGTH: 6 inch includes: 3 dart flights, 3 soft shafts, 1 box. ✔ FLY LIKE AN EAGLE: The ergonomic wide glide flights of our darts have been specially designed to help increase speed and minimize drag. This gives you more control of the flight path of your darts - and that little edge over the competition! ✔ EASY TO DEPOSIT & CARRY: It will make your projections more accurate. they have a good balance and much easier to get where you want them. ✔ FLIGHT&PROFESSIONAL DARTS: This weight makes darts flight straight and tight. then these darts will greatly improve your game. The surface have good grips. ✔ GREAT GIFT: Ideal gift for beginners and casual darts players. If you have any questions about this product by FightingFly, contact us by completing and submitting the form below. If you are looking for a specif part number, please include it with your message.